I have recently added a lot of pictures to this page. Please give it time to load. Thanks! Pictured here are my great-grandfather's brother, Albert (right, in WWI-era uniform), his wife (center, we do not her name but her initial may have been "M"), and his oldest son, Fritz (right, also in uniform). They lived in Gross Gansen, Stolp, Pommerania. I have had the recent good fortune to be contacted by another Jaffke researchers in Germany, and they have been helping me with translating the inscriptions written on the backside of these pictures, and providing transcripts of old church records. This information has helped in not only indentifying these long-ago family members, but has added new members to these families. I have added additional information about the people in each picture; just click on the links above to see the new pages. Use your BACK button to return to this page. Carl Jaffke (1) was born around 1843, probably in Stolp Kreis, Pommerania, and may have died in or around 1901, probably in Stolp Kreis, Pommerania. He married Pauline Lieder possibly between 1865-1867. She was born between 1840-1850, possibly in Stolp Kreis, Pommerania; her date of death is unknown. Franz Frederick, ("Frank, Sr."), born September 26, 1868 in Gross Gansen, Stolp, Pommerania; he died on May 02, 1952, Toledo, Ohio. He married Mathilde Caroline Zupke on May 2, 1891 in Gross Dubsow, Stolp, Pommerania. Adeline Albertine Ludowike Jaffke, born October 10. 1870 in Gross Gansen, Stolp, Pommerania. Otto Friedrich August Jaffke, born March 15, 1873 in Gross Gansen, Stolp, Pommerania. He married Gertrude (?). Paul Carl Jaffke, born August 18, 1875 in Gross Gansen, Stolp, Pommerania. Albert August Richard Jaffke, born February 10, 1878 in Gross Gansen, Stolp, Pommerania; he died after 1952 in Germany. He married M (Minna? ), born about 1879, possibly in Gross Dubsow, Stolp, Pommerania. Heinrich Emil Jaffke, born March 25, 1881 in Gross Gansen, Stolp, Pommerania. Carl Friederich Hermann Jaffke, born March 25, 1885 in Gross Gansen, Stolp, Pommerania. 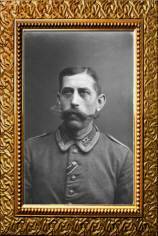 We have little information about Frank Jaffke's family in Germany. Most of what we know comes from some old pictures with some names and dates written on the back, as well as a few old documents. These pictures all date from before the Second World War, and are the family of Frank Jaffke, Sr's brother, Otto Jaffke and his wife, Trude (Gertrude?). I have no idea how the family fared during and after World War II. Stories I heard as a child told of members of great-grandfather's family who lived in Potsdam, not far from Berlin. The address of the photographer for several of these pictures is in Berlin. From the information written in German on the backs of these pictures, they are Left: Otto Jaffke and Family, taken around 1920. His wife's name was Trude, likely short for Gertrude, but the daughters' names are not known to me. Center: A family picture taken around 1934 or '35. Otto and Trude are seated in front, the two daughters stand in back. The gentleman standing with them may be the husband of one of the girls. Right: An outdoor picture taken in 1935. Otto is seated on the right, and Trude on the left. The older woman seated next to Otto is named Frida, but I am unsure who she is related to. Perhaps she is Trude's mother. 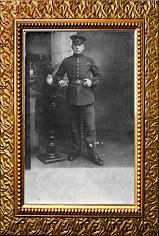 Franz "Frank" Frederick Jaffke, (Frank Sr 2, Carl 1) was born September 26, 1868 in Gross Gansen, Stolp, Pommerania, and died May 02, 1952 in Toledo, Ohio. He married Mathilde (Matilda) Caroline Zupke May 02, 1891 in Gross Dubsow, Stolp, Pommerania, daughter of Heinrich Zupke and Karoline Schroeder. She was born on March 11, 1870 in Klein Dubsow, Stolp, Pommerania; she died November 07, 1926 in Toledo, Lucas County, Ohio. For more information on the ZUPKE family, click here. Franz, Mathilda and their infant son Paul sailed in 1893 from Hamburg, Germany to America aboard the ship Dania. They came to Toledo, Ohio where Mathilda's sister and brother-in-law, Frederick and Emma Taube, were already living. Franz "Americanized" his first name to Frank, and declared his intent to become a naturalized citizen of the United States, and was sworn in as such in 1900. Mathilde apparently never became a citizen, perhaps following the old world custom of the husband being the person responsible for all such matters. The population of the part of Toledo where the Jaffkes lived was made up of two predominent ethnic groups -- German and Irish. Echoes of these German ancestors can still be found in the names of churches and businesses in the area -- St. Lucas Lutheran Church and her sister congregation, First English Lutheran Church (so called because the church was founded by members of St. Lucas who decided to have their services conducted in English rather than German), and Titgemeier's Feed Store, a business Frank Jaffke worked for and that is still a thriving enterprise. Frank's brother-in-law, Frederick Taube, sold the Jaffkes their house, located on Morton Street. The Jaffkes were members of St. Lucas Lutheran Church, and Frank helped with the construction of the present church building, a beautiful "old world" style stone bulding. Pictures from Toledo's "Old South End"
Frank and Matilda Jaffke, taken at their Morton Street house ca. early 1920s. Paul, born June 12, 1892 om Gross Dubsow, Stolp, Pommerania; died January 1972, Dearborn or Detroit, MI; m. (1) Unknown; m. (2) Faye. Bertha Maria Emma, born February 23, 1895, Toledo, OH; died March 02, 1895, Toledo, OH. Frederick "Fred" Johann Theodor, born June 06, 1896, Toledo, OH; died September 15, 1964, Toledo, OH. Franz "Frank" Herman August, born August 25, 1898, Toledo, OH; died December 17, 1968, Toledo, OH. Edward Carl August, born January 10, 1901, Toledo, OH; died Abt. April 20, 1901, Toledo, OH. 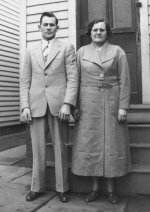 Otto Friedrich August, born February 15, 1902, Toledo, OH; died January 10, 1969, Grand Rapids, Kent County, MI; m. Ella A. Mueller, November 30, 1946, Bay City, MI; born 1899. Anna Ida Augusta, born April 03, 1904, Toledo, OH; died February 22, 1973, Toledo, OH. Harry Heinrich Fritz, born March 08, 1906, Toledo, OH; died November 1974, Maumee, OH. August "Augie" Heinrich Franz, born May 22, 1908, Toledo, OH; died July 19, 1996, Sugarland, TX. Margarethe "Margaret" Emma Mathilda, born February 27, 1909, Toledo, OH; died Abt. 1955, Toledo, OH. Marie Emma, born September 11, 1912, Toledo, Ohio; died December 23, 1991 Toledo, OH; m. Earl Leroy Wagner, May 23, 1944, Toledo, Ohio; born June 29, 1897, Bath, Clinton County, MI; died December 22, 1970, Lansing, MI. Martha Augusta, born September 11, 1912, Toledo, OH; died February 1992, Toledo, OH. Four of the sons of Frank and Mathilda Jaffke. From left to right, they are: Frank Jaffke, Jr. at the time of his confirmation. still located at the corner of Frank and Walbridge streets in historic old South Toledo, Ohio. Otto Jaffke, picture taken during World War 2.
but served stateside during the war. Harry Jaffke, also at the time of his confirmation. Augie Jaffke as a young man. Frederick "Fred" Johann Theodor Jaffke 3 (Frank Sr 2, Carl 1) was born June 06, 1896, and died September 1964 in Toledo, Ohio. He married Leda Marie Duval in Toledo, Ohio. She was born March 15, 1896, and died November 16, 1984 in Toledo, OH. Howard Jaffke, born March 31, 1924. 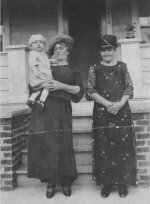 Pictures with two grandmothers, Cleophee (Lemieux) Duval and Mathilda (Zupke) Jaffke. Left: Cleophee Duval, Mathilda Jaffke and their infant grandson, Howard Jaffke. Picture may have been taken on Easter Sunday, 1925. Middle: Cleophe, Mathilda and Leda (Duval) Jaffke with Howard (in his Gramma Jaffke's arms), probably taken in 1924. Right: Howard Jaffke as a toddler. Franz "Frank" Herman August Jaffke 3 (Frank Sr 2, Carl 1) was born August 25, 1898 in Toledo, Ohio, and died December 17, 1968 in Toledo, Ohio. He married Margaret Mollie Zanter June 20, 1931 in Toledo, OH, daughter of Herman Zanter and Amelia Schmidt. She was born August 04, 1908 in Toledo, Ohio, and died October 04, 1974 in Toledo, Ohio. Robert Franklin Jaffke, born March 15, 1934 in Toledo, OH. Donald Barton Jaffke, born May 17, 1940 in Toledo, OH. He died in June of 1976 in Toledo, OH. 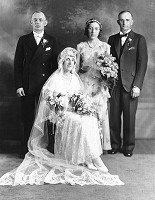 Left: Frank and Margaret's wedding picture, June 20, 1931. Middle: Three generations, grandmother Molly Zanter, daughter Margaret (Zanter) Jaffke, and grandson Robert Jaffke. Right: Brothers Bobby and Donald Jaffke at play. Anna Ida Augusta Jaffke 3 (Frank Sr 2, Carl 1) was born April 03, 1904 in Toledo, Ohio, and died February 22, 1973 in Toledo, Ohio. She married Joseph Charles Walker November 25, 1923 in Monroe, Michigan, son of Michael Bendzela/Bengela and Anna King. He was born March 16, 1904 in Horvat Gurab, Hungarian Empire (now Slovakia), and died December 31, 1950 in Toledo, Ohio. Left: Anna Jaffke's confirmation picture. Anna, along with all of her family, was a member of St. Lucas Lutheran Church in Toledo, Ohio. The church was founded by German immigrants and their families, and still had services in that language until the late 1930s-early 1940s. Middle: Anna Jaffke with her cousin and best friend, Elsie Taube. Right: Anna (Jaffke) Walker in a picture taken in the backyard of her house at 702 Bowman Street, Toledo, Ohio. Norman Frank, born February 11, 1924; died October 04, 2000, Brooklyn, MI. Donald Paul, born March 18, 1925, Toledo, OH; died 1925, Toledo, OH. Gale Frederick, born July 19, 1926, Toledo, OH; died May 02, 1997, Toledo, OH. Dolores Ann, born December 16, 1929, Toledo, OH. Wayne Louis, born April 26, 1932, Toledo, OH; died September 20, 1932, Toledo, OH. Harry Heinrich Fritz Jaffke 3 (Frank Sr 2, Carl 1) was born March 08, 1906 in Toledo, Ohio, and died November 1974 in Maumee, Ohio. He married Alam Burmeister May 11, 1927 Toledo, Ohio. She was born February 06, 1905, and died December 1968 in Maumee, Lucas County, Ohio. Wilma Christina Jaffke, born December 07, 1932. 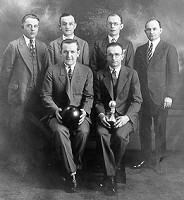 St. Lucas bowling team; Harry is seated front row, left. August "Augie" Heinrich Franz Jaffke 3 (Frank Sr 2, Carl 1) was born May 22, 1908 in Toledo, Ohio, and died July 19, 1996 in Sugarland, Texas. He married Alice Hurdlebrink May 25, 1929 Toledo, Ohio. This is Augie and Alice's wedding picture. They were married at St. Lucas Lutheran Church, Toledo, Ohio. Marilyn Esther Jaffke, born January 15, 1931, Toledo, OH. Margarethe Emme Mathilda Jaffke 3 (Frank Sr 2, Carl 1) was born February 27, 1909 in Toledo, OH, and died Abt. 1955 in Toledo, Ohio. She married (2) John Dullinger July 14, 1934 in Toledo, OH. Phyllis Dullinger, born August 26, 1931 in Toledo, OH. Martha Augusta Jaffke 3 (Frank Sr 2, Carl 1) was born September 11, 1912 in Toledo, Ohio, and died February 1992 in Toledo, Ohio. She married Johann "John" Putz November 12, 1932 in Toledo, OH. He was born October 08, 1904 in Bavaria, Germany, and died December 1982 in Toledo, Ohio. Melvin Floyd, born May 05, 1934, Toledo, OH; died February 21, 1979, Toledo, OH. Left: Confirmation picture of the twins, Marie and Martha Jaffke. Left Center: Formal picture of Marie and Mart. Right Center: Martha Jaffke and her husband, John Putz. Right: Marie and her husband, Earl Wagner.